Teacher – pupil ratio is one of the challenges the education is currently grappling with in the country. The recommended teacher – pupil ratio is 1:60, however, this seems to be unrealistic on the basis that some teachers have no option but to manage more than 200 learners in a single class. Mark Kamphira, 35, is a classic example of volunteer teacher at Chiguma Primary School in Blantyre. He is the headmaster and the only available teacher at the school which has over 315 learners with classes from Standard 1 – 7. This development means, therefore, that Kamphira, apart from the imbalance teacher – pupil ratio which is already beyond the recommended minimum standard, has a huge task of managing all the seven classes alone, five days a week. It is undisputable that Kamphira works beyond the dictates of hard work. His daily routine on how he juggles around the seven classes attest to the fact that he puts much effort to his work despite being unqualified. Dedication best describes Kamphira’s personality in his pursuit to making sure the children from the farthest end of Blantyre District acquire the basic literacy and numeracy skills. “I spend the rest of my day at the school. I seriously don’t have the luxury of free time. My only time to break is when I am shifting from one class to another but not necessary sitting down to enjoy a cool breeze,” he told Malawi News Agency (MANA) in interview. Kamphira started the thankless teaching job in 2014 having been approached by the community to assist children in the area who could not endure walking a 10 kilometre distance to the nearest primary schools. Kamphira said he already had passion for teaching and that he was motivated by the fact that it is father’s original home area as such didn’t want to allow his ‘brothers and sisters’ fail to access education because of the absence of a teacher. “Although I knew that this would be a huge task on me, I chose to sacrifice my happiness and time just to bail out children from this area whose majority dropped out of school due to long distances to the nearest school,” the head teacher explained. In the morning, Kamphira divides his time meticulously. For example, he starts by teaching Standard one and two classes which he says are crucial in as far as education is concerned in view of the fact that they were the foundation for all levels in the education cycle. Later in the day, he moves into other higher classes and ensures that on daily basis, he has taught all the seven subjects in all the upper classes without compromising on quality. “Mathematics, English, Chichewa, Life Skills, Social Studies, Science and Agriculture are the subjects that I concentrate much on. I always make sure that I teach all the classes the seven key subjects,” he narrates. Quite contrary to how other learning institutions were established, Chiguma Primary School came into being through efforts by communities of Senior Chief Kunthembwe in 1998 as one way of reducing the distance that pupils in the area were traveling to access primary education. Since then, the institution has experienced massive resignation of volunteer teachers which lead to it’s on and off status for quite some considerable time now. This has been the trend largely because volunteer teachers couldn’t bear with the peanuts they received from the few poor, yet willing parents. Since the time Kamphira set out on a mission to Chiguma Primary School which was then operating from church structures, there hasn’t been any break ups. It has always been up and running, courtesy of his dedication and personal commitment to improve the education standards in the community in addition to brightening the future of young ones in the area. “I don’t care about my future and life in general. All I want is to use the little education acquired to change my community and of course polish the future of the little ones in this village,” he added. Much as Kamphira may have all the passion to uplift the education standards of his kindred, he also has some sad tales to share. He says sometimes he has to dig deeper in his pockets to mobilize teaching materials since the school does not have funds for buying such items. As if that was not enough, it has also proved increasingly difficult for the community which hired him to honour their pledges of paying him the K15, 750 monthly honoraria raised through contributions. Kamphira laments that sometimes he has to endure two months without any payment a development that is affecting his performance, particularly on how to balance work and survival. However, despite all the struggles, Kamphira, ever driven by the spirit to sharpen the future of his community remains steadfast. Every bright new day brings renewed energy since he has the welfare of the children at heart. In this regard, Kamphira attempted to reach out to the district education authorities in Blantyre through the school committee for a hand, a development which proved to be a non-starter on the basis that the school was not yet recognized by government. 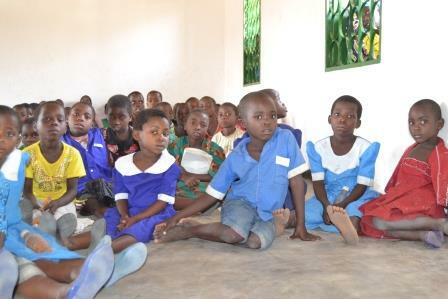 District Education Manager (DEM) for Blantyre Rural responsible for primary education, Paul Chiphanda admits that his office was aware of the presence of a single teacher at the school and the attendant challenges the institution was facing. He pointed out that it was difficult for the ministry to act on the needs of the school as it was not yet handed over to government. He adds that the community in the area together with management of Majete Wildlife Reserve were responsible for the affairs of the institution as a result government could not be involved with something it does not own or indeed recognize. “The issue of a single teacher at the school was brought to the attention of my office but we could not make a decision as it was not yet given to us to start managing it,” Chiphanda assured. Despite the school not being registered, the district education manager salutes Kamphira for his determination and hardworking spirit, promising to secure him a place in one of the Teachers Training Colleges (TTC) so that he could advance his career. “This is extraordinary, to say the least. I am equally concerned with how he has been managing all the classes for the past three years, alone. I have a background of teaching, therefore, I know what it is all about to manage such a big school,” he noted. Chairperson for Chiguma School Management Committee, only known by the name Moses hailed Kamphira for defying the odds. Moses said the community has benefited immensely from the lone teacher. “Our children are now able to read and write, all because of Kamphira. We are very grateful to him,” he acknowledges. Executive Director for Civil Society Coalition for Quality Basic Education (CSCQBE), Benedicto Kondowe while acknowledging the good work that Kamphira was doing says the situation only underscores the fact that there were a number of hurdles to surmount in pursuit of attaining quality education in the country. He pointed out that it was unrealistic for a single teacher to manage a school with seven classes and still expect good performance from the learners. “That is one of the issues that the education sector is grappling with – we have visited schools in Chikwawa and Mchinji districts where three if not two teachers at worst are managing a full primary school,” Kondowe said. “In actual sense, we are not providing quality education but rather creating environments where children just go and play. Frankly speaking, the right to education is being violated,” he said. He registered appreciation of the efforts that Kamphira was making, asking the Ministry of Education, Science and Technology to devise a way of rewarding the industrious and volunteer extraordinaire. “I can imagine that this teacher works like a computer. How does he prepare schemes of work? He really needs to be rewarded in one way or the other,” Kondowe suggested. Malawi is a signatory to the Dakar, Senegal’s framework on the goals for education for all which among others strive for early childhood education, free and compulsory primary education. More often than not, however, such efforts face obstacles ranging from shortage of qualified teachers, learning and teaching materials, poor school infrastructure. But for now, Kamphira does not falter on his mission but continue with his teaching exploits and promises to write education authorities to consider advancing his teaching capabilities.